Mr. Kang Hyun-Seop, director of Health Administration Division of Gangnamgu Office, delivers a speech in Australia. 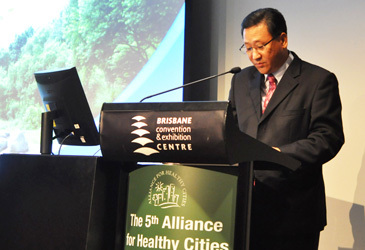 South Korea’s Gangnam City swept three important awards at the 5th Global Conference of the Alliance for Healthy Cities (AFHC) held at Brisbane Convention & Exhibition Centre in Brisbane, Australia on Oct. 24-27, 2012. The biennial AFHC global healthcare conference was attended by well over 1,000 mayors, healthcare officials and other experts from over 140 municipalities of eight countries. More than 10 municipal cities including Wonju of Gangwon Province, Gangdonggu, and Yangcheongu from South Korea took part in the conference. 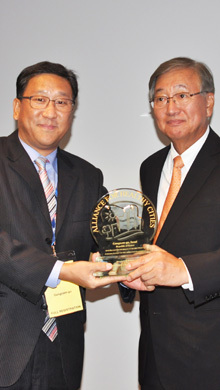 Mr. Kang Hyun-Seop, director of Health Administration Division of Gangnamgu Office, receives the award from Dr. Shin Young-Soo, WHO regional director for the Western Pacific. This year’s conference was held under the theme of “Healthy Urbanization: Healthy People, Healthy Communities.” It was hosted by Logan City, Griffith University, and the Australian Chapter of the AFHC, and presided by Mayor Sandra McCarthy of Brisbane. On behalf of Gangnamgu Mayor Shin Yeon-Hee, Mr. Kang Hyun-Seop, director of Health Administration Division of Gangnamgu Office, received the awards. Director Kang led the Gangnamgu’s Medical Tour Delegation to the conference. The other participants were Mr. Kim Yong-Beum, manager of Gangangu’s Ubiquitous Healthcare Team and Ms. Oh Kyung-Im, an officer of the team. The two awards — “Award for Healthy City with Strong Action Gangnam Oct. 25, 2012 Brisbane, Australia” and “Award for Creative Developments in Healthy Cities 2012 Ubiquitous City, Gangnam, Oct. 25, 2012, Brisbane, Australia” — were presented by Brisbane Mayor Sandra McCarthy to Director Kang for Gangnamgu’s successful implementation of public healthcare administration. 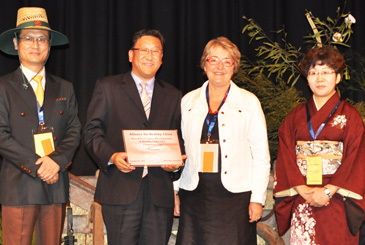 Mr. Kang Hyun-Seop (2nd from left), director of Health Administration Division of Gangnamgu Office, poses with Brisbane Mayor Sandra McCarthy, and other VIPs. The third award "Best Practice Award" was presented by Dr. Shin Young-Soo, WHO regional Director for the Western Pacific, for Gangnamgu’s mobilizing support for 100 percent smoke-free environment. A total of 21 cities and organization were awarded in this year's conference. The winners were announced by the chairman of the Alliance’s award committee, Prof. Albert Lee of Chinese University of Hong Kong. Director Kang was one of the 11 speakers who made key-note addresses and presentations during the conference. On the first day of the four-day conference Director Kang delivered his speech. In his speech Director Kang explained about how Gangnamgu successfully turned its main streets into smoke-free zones, drawing the huge accolades from over 1,000 crowds. 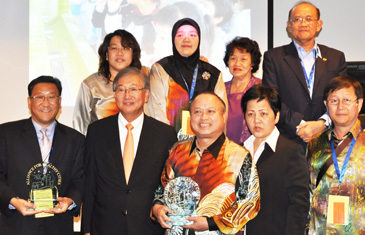 Mr. Kang Hyun-Seop, director of Health Administration Division of Gangnamgu Office, poses with other awardees. Starting in 2007 Gangnamgu became a model municipality in Seoul Korea for its bold “tobacco prohibition policy. The affluent city also succeeded in implementing a series of ts public health policies. In particular, Gangnamgu is considered as South Korea’s model city for promoting medical tourism with 2,400 hospitals and clinics within its precinct. Meanwhile, “Declaration of Brisbane” was announced during the conference to emphasize the notion of “futurism” in the field of public healthcare of each cites around the world. The declaration was based on the presentation made by Prof. Trevor Hancock of Victoria University in Canada. He called for the social balance and sustainability in adopting public health policies in his presentation. In 2010 Gannamgu hosted the 4th Global Conference of the Alliance for Healthy Cities (AFHC).